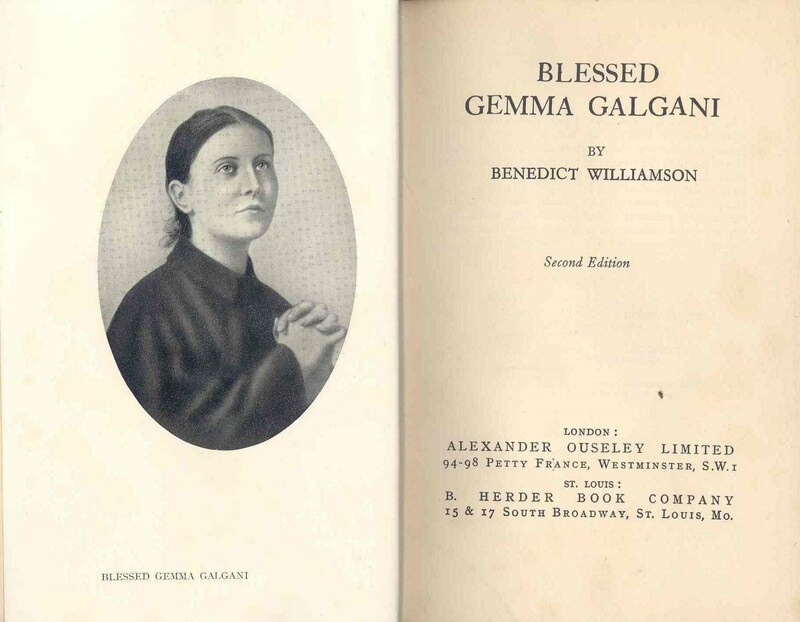 Source for this article is the excellent book entitled “Blessed Gemma Galgani” by Benedict Williamson, 1933, 2nd edition. The 1st edition of this book was published under the title “Gemma of Lucca”, 1932. During the years that have intervened since the day that she flew to God, the fame of Gemma of Lucca has travelled to the ends of the earth, and the story of her heroic life has appealed to the peoples and races of all nations. From amongst the many spiritual graces and miraculous cures wrought through the intercession of the saintly Virgin of Lucca in the early years of her passing we shall select but a few. Maria Menicucci of Vitorchiano in the Province of Rome was suffering great pain from a disease which surgeons pronounced to be an acute form of synovitis, which they said was incurable. A novena was begun to Gemma and a relic of her applied to the knee. On the last day of the novena, when the bandages were removed, the knee was found to be perfectly normal. "Gemma has heard my prayer," she wrote to a friend. "I am cured as you will see by the enclosed medical certificate. I am beside myself with joy." This miracle was included in the ordinary process [for Beatification] held at the Episcopal Curia of Bagnorea in the year 1909. Filomena Bini of Pisa, was suffering from a malignant stomach disease which was pronounced by the doctors to be cancerous. She was seventy-two years of age and the doctors said it was impossible to do anything. A relic of Gemma was applied to the sick woman, who had not slept for a long time owing to the intense pain she was enduring. She at once fell asleep and did not wake till the morning, and on awaking found herself perfectly cured. The doctor was amazed at finding on examination that all traces of the disease had disappeared. "It is a miracle wrought by God," he exclaimed and later certified. Isolina Serafini of Vicopelago near Lucca was suffering from acute meningitis from December, 1906 to October 1907. In her sufferings she turned to Gemma: "If you cure me I shall take it that you are a saint and that you are in heaven, and I will make it known immediately." She lay down and slept soundly, and from that time all trace of the disease disappeared. A young girl, Giovanna Bortolozzi, at Miidchenheim in Switzerland, was suffering from a large tumour in the arm-pit. 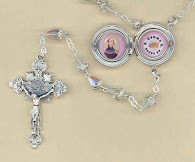 The doctor was to operate in three days' time, but the sister-in-charge assured the girl that Gemma would cure her; She tied a relic of Gemma upon the arm and began a novena. When the doctor (a Protestant) came to perform the operation he found the tumour had completely disappeared. "It is a miracle," he exclaimed. The poor girl soon returned to her work full of gratitude to her heavenly protectress. A young boy, Gioocchino Nuccio of Palermo, was taken dangerously ill with tubercular peritonitis and nephritis and was in hospital from November 1911 to February 12th, 1912, when, there being no hope of recovery, he was taken home so as to die amongst his own people. 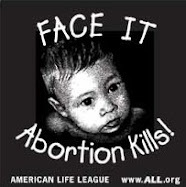 On the evening of February 16th, a picture of Gemma was placed upon the dying boy, who had already lost consciousness. About ten o'clock in the evening the child recovered consciousness and then fell asleep, and on the morning following was found to be completely cured, and actually got up and went for a walk in the city, to the amazement of all. From that time the boy has not manifested the least trace of the disease, as is attested by the two doctors, Cannata and Caronia. A Camaldolesian monk, Dom Thommaso, states that after suffering from continual pain in the spine, which often prevented his being able to stand up, for over twelve years, he began a novena to Gemma and after two days was cured. "It seems," he writes, "that I have returned from death to life." Angela Pantalei of Sigillo, near Perugia, was taken dangerously ill with an ulcer of the stomach, and her condition became so critical that the doctor said she had only a few hours to live. 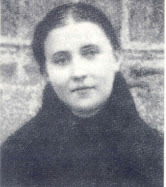 The Sacrament of Extreme Unction was administered, and her relatives were awaiting the end when it occurred to one of them, Sister Constanza Severini, to invoke the intercession of Gemma for her cure. She gave a picture of Gemma to the dying girl, who immediately felt better as soon as she had taken hold of it. She was cured, and in a few days returned to her ordinary occupations. Luigi Busignani, an engineer of Sassari, was taken suddenly ill with acute appendicitis, which caused him the most indescribable suffering, so that he could sleep neither by day nor night. He was taken hastily to the hospital, where after examination the surgeon declared an operation was necessary if his life was to be saved. 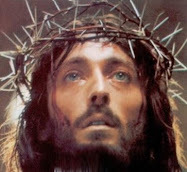 An old friend recomended him to pray to Gemma, who was working wonderful miracles. He began a novena to her and himself describes his experience: "I felt new strength enter every fibre of my being, and a new energy in my whole body and, forced as if by an invisible hand, I sprang out of bed .... I was perfectly cured." We must also relate a few of the early spiritual miracles that are even more wonderful than those of the physical order. At Pietrapaole, in the Province of Cosenza, Signora N. had greatly at heart the conversion of a sinner who, for years, had forsaken the Sacraments. For two years she prayed without result, then hearing of Gemma began a novena to her, and on the eighth day the grace was granted, and the sinner returned to God. From Menzingen, in Switzerland, Sister Francesca writes of the conversion of a young German who, for ten years, had been away from the Sacraments. Through the intercession of Gemma he made his confession and went to Holy Communion at the Sanctuary of Einsiedeln, and always wears a relic of Gemma and prays through her intercession that he may persevere in the right way. A mother was greatly distressed that her son, already fifteen years of age, was unable to make his first Communion, owing to the resistance of her husband. She prayed to Gemma and the father quite spontaneously gave his consent. From Brussels Father Raynaldus writes: "I knew of a person who at one time led a devout life, but who had since abandoned Mass and Sacraments and was given up to every sort of iniquity. I wrote a little note about this poor sinner and placed it behind a picture of Gemma and the very same day this soul returned from death to life, and now never passes a day without receiving Holy Communion." From Lyons. Filomena Bonnabaud, a nurse, was called to a certain sick man, and on entering the patient's room was surprised to see a card over his bed on which was written in large letters: "I want no priests about my bed." She felt distressed on having to assist at the last moments of a person in such dispositions, and thought of giving up the case, but her confessor advised her to remain and gave her a picture of Gemma to place in the sick room, where no one could see it. After two days the dying man asked for the priest, to the stunned amzement of all, and received the Sacraments, and five days later died in admirable dispositions. A Passionist Father, writing from the Argentine in 1912, relates the following experience while giving a mission at Ju Juy in the diocese of Salta, [Argentina]. He visited the hospital of S. Rocco, served by some Italian sisters from Orto, and there found an Italian from Venice who, although dying, refused to be reconciled to God. He scoffed at every attempt on the part of the religious to convert him, and said: "I received my first communion from Pius X when he was a simple priest. But at fifteen years of age I lost my faith and want to hear no more about it. So leave me in peace." The missioner priest departed, and suddenly thought of getting a relic of Gemma placed without his being aware of it under the pillow of the dying sinner. Not a quarter of an hour had passed before the sick man called a sister and said he wanted to make his confession at once. He did so with great fervour and in order to atone for the scandal he had given in the hospital, asked to receive the Holy Viaticum solemnly, and two days later passed away in peace and tranquillity. Father Francisco, writing from Brazil in 1913, relates the story of an old Brazilian who had, although baptized, never practised his religion. He rejected every attempt that was made to induce him to receive the Sacraments. The sisters of S. Joseph, who were nursing him, invoked Gemma for his conversion, and the very next day he asked for the priest and made his confession, received Holy Communion and Extreme Unction with the remarkable devotion. 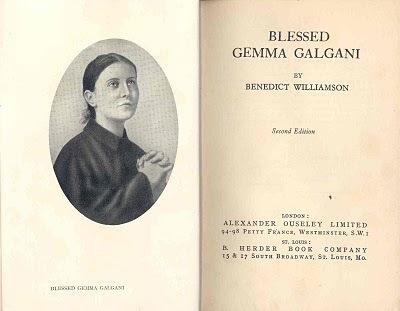 "With this declaration I intend to render public homage to the Servant of God, Gemma Galgani. At the end of July 1931 I was stricken with nervous exhaustion and a deep depression, partly on account of having been informed I was suffering from diabetes to such an extent that I feared I should lose my reason. 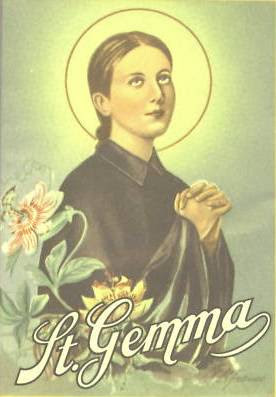 My family and I, especially my mother, was advised by an excellent priest we met while in the country at Vitorchiano to have recourse to the intercession of Gemma, and I placed her picture on my forehead. After a few days I began to get better, and months later I am now able to say that the crisis has completely passed away." Wonderful article, as always. Thank you Glenn ! Thank you St Gemma.I have had many health problem over the years begining with heart surgery as a 3yr old. I had 2 back surguries in 2006 2008 to try to help my chronic back problems, I also had liver disease and needed my gall bladder and 12 stones removed, then last year I had another open heart surgery at age 49 for a hole in the heart and other problems.After surgery I suffered a stroke (my 2nd stroke) but began to recover. I know that prayer has been my rock to cling to and shortly after my heart surgery I began to pray to many of the Saints. I pray daily to St Gemma because a week before Christmas , still recovering from heart surgery I was told I have a tumor in my neck. I was told it is benign but will need to be removed.....more surgery. I was told it is 14mm in size. I began to more deeply pray asking St Gemma for a miracle to take away the tumor.I KNOW wihtout doubt she has heard me I know the tumor will be removed by St Gemma. I sometimes feel a small pulling sensation in my neck and I know this is St Gemma slowly taking away the tumor. I just know. I delight in her miracle and sinner that I am feel completely undeserving of such a miracle. I will go again in June for another scan to measure the tumor. I believe 100% that if not gone all together that it will be much smaller. I know St Gemma is answering my request for a miracle. Bless St Gemma ......Amen x I will update my results to you late June.